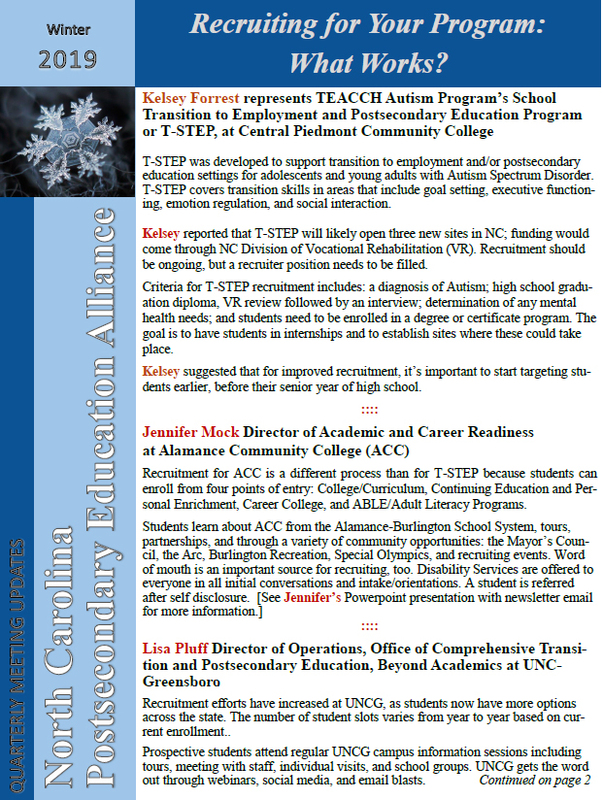 The North Carolina Postsecondary Education Alliance is a diverse group consisting of emerging leaders with developmental disabilities, representatives of state agencies and organizations, legislators, educators, and families as well as other advocates. Our mission is to expand the options for postsecondary education for individuals with developmental disabilities throughout North Carolina. This website provides a list of resources pertaining to the PSE options across the state of North Carolina. In addition, you can find recent NCPSEA newsletters as well as information about upcoming alliance meetings. The following resource contains information about PSE programs, including community colleges and universities, across North Carolina. You will find contact information and website addresses so you can learn more. Click Here for a current list of our PSEA members. If you would like to be included on our mailing list, please contact Deb Zuver at deborah.zuver@cidd.unc.edu.